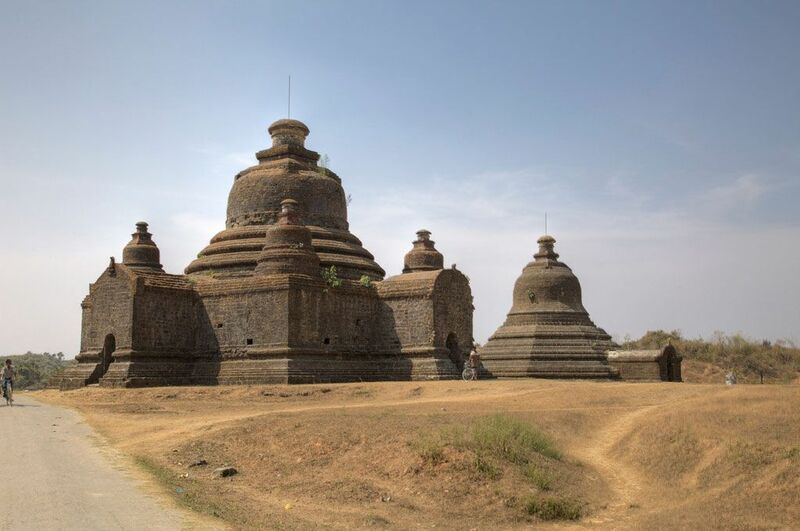 Mrauk U is an archaeologically important town in northern Rakhine State, Myanmar.It is also the capital of Mrauk-U Township, a sub region of the Mrauk-U District. From 1430 until 1785, it was the capital of the Mrauk U Kingdom, the most important and powerful Rakhine (Arakanese) kingdom. 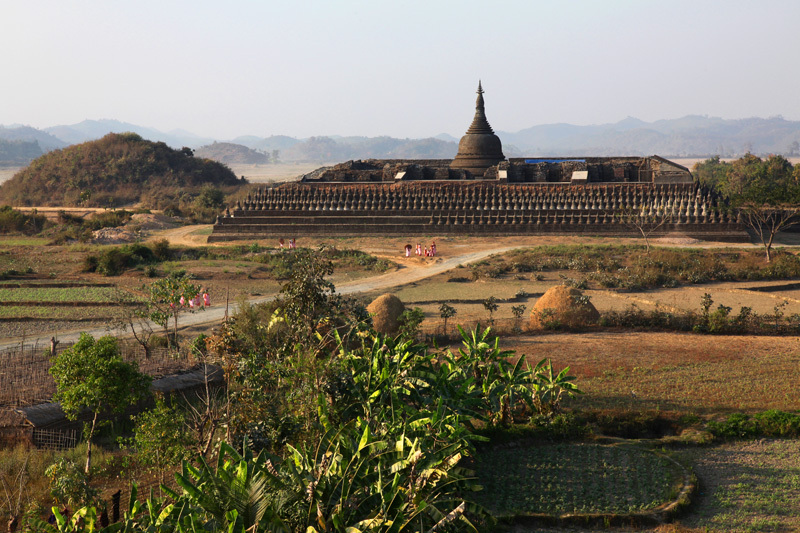 Mrauk U lies roughly 11 kilometres (6.8 mi) east of the Kaladan River in the banks of its minor tributaries. The town is located on a small outcrop of the Rakhine Yoma on the eastern side of the Kaladan's alluvial plain. Thus, the surrounding countryside is hilly yet also contains a great deal of marshes, mangroves and lakes. 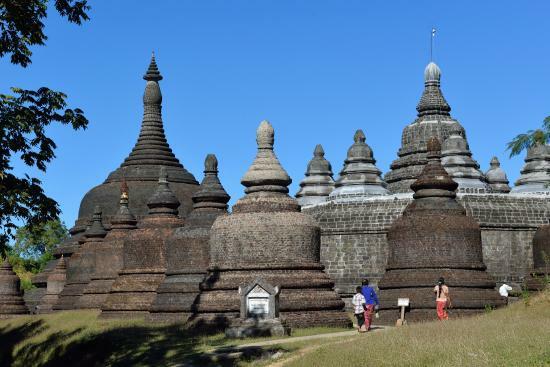 As Mrauk U and her kingdom prospered, the kings, ministers and peasants built many pagodas and temples around the town to reflect their faith. Thus, Mrauk U houses a rich collection of temples and pagodas second only to the Central Burmese town of Bagan in Myanmar. 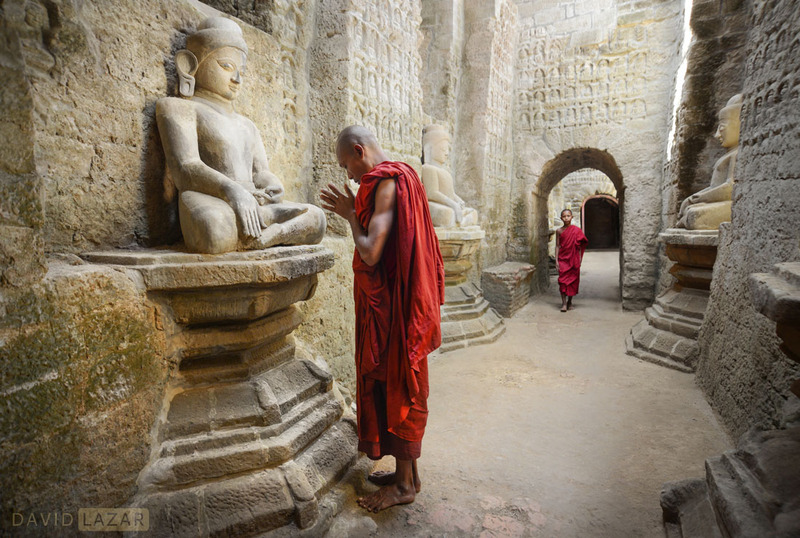 Most of Mrauk U's temples were constructed of hewn stone bricks, unlike the mud and clay bricks of Bagan. In 2017, an international commission urged Myanmar to nominate Mrauk U for UNESCO World Heritage Site status. Shite-thaung Temple, Htukkanthein Temple, Koe-thaung Temple, Andaw-thein Ordination Hall, Le-myet-hna Temple, Ratana-pon, Five Man Pagodas (Mingala Man Aung Pagoda,Ratana Man Aung Pagoda, Sakya Man Aung Pagoda, Lawka Man Aung Pagoda,Zina Man Aung Pagoda), Sanda Muni Temple, Bandula Kyaung Monastery. 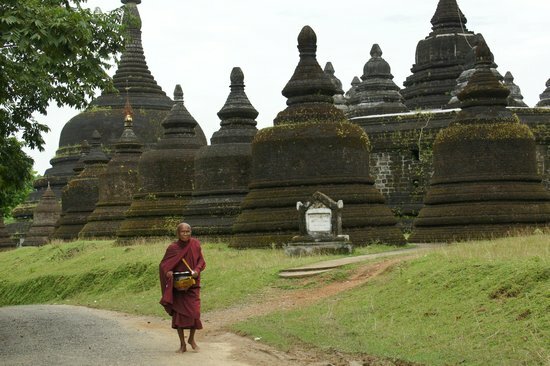 Mrauk U is a primarily Buddhist site, there are several religious buildings of other faiths. The most notable would be the old Shindhikhan Mosque, built during Min Saw Mon's reign, in the southeast of the town. Friar Manrique also mentions the presence of a Roman Catholic church and a small number of converts and foreign born Catholics. Shai-thaung Temple is a famous temple in Mrauk U. The name means 'Temple of 80,000 Buddha Images', and is also known as the 'Temple of Victory'. The temple was built in 1535–1536 by King Min Bin to commemorate his conquest of Bengal. It is located on the western face of Pokhaung Hill, north of the Royal Palace, and adjacent to the Andaw-thein Temple. Htukkanthein is one of the most famous temples in the ancient Arakanese city of Mrauk U, in Rakhine State, Western Myanmar. The name means "Cross-Beam Ordination Hall". 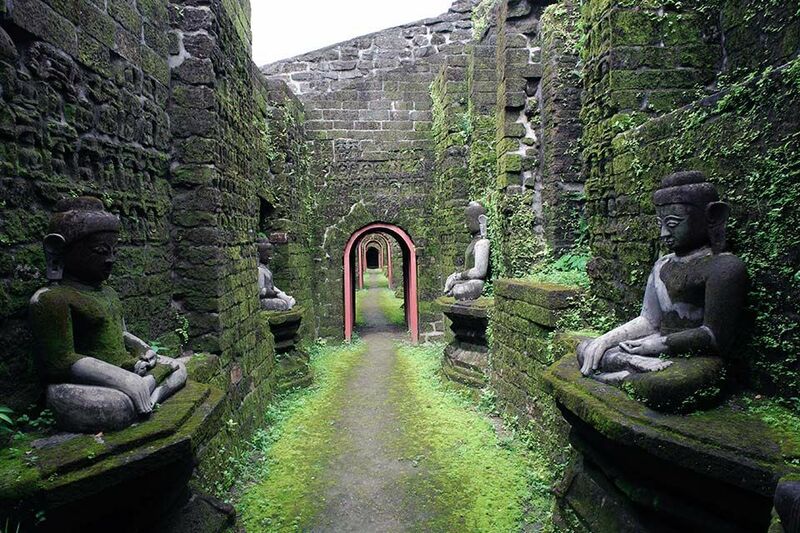 Like most of Mrauk U's Buddhist temples, it is designed as a dual purpose 'fortress-temple'. Although it is a 'thein' (Ordination Hall), it is one of the most militaristic buildings in Mrauk U, built on raised ground, with a single entrance and small windows. The temple enshrining the statues of Buddha was built in 1571 by King Min Phalaung. It is located on a small hill a stone's throw away from the Shite-thaung Temple. Koe-Thaung is the largest temple in Mrauk U, Myanmar. The name means "Temple of 90,000 Buddha Images". The temple was built between 1554 and 1556 by King Dikkha. Andaw-thein Temple is a temple in Mrauk U located at the northwest corner of the Shite-thaung Temple. The name means 'Tooth Shrine'. It contains a tooth relic of the Buddha coming from Sri Lanka. It was first built as an ordination hall 1534 between 1515 and 1521 by King Thazata, and restored by Min Bin between and 1542. Le-myet-hna is a temple in Mrauk U located at the northwest corner of the Shite-thaung Temple. It has four entrances, one to each cardinal point and eight seated Buddha round a central column. It was built by King Min Saw Mon in AD 1430. Temple was entirely constructed with black sand stones. 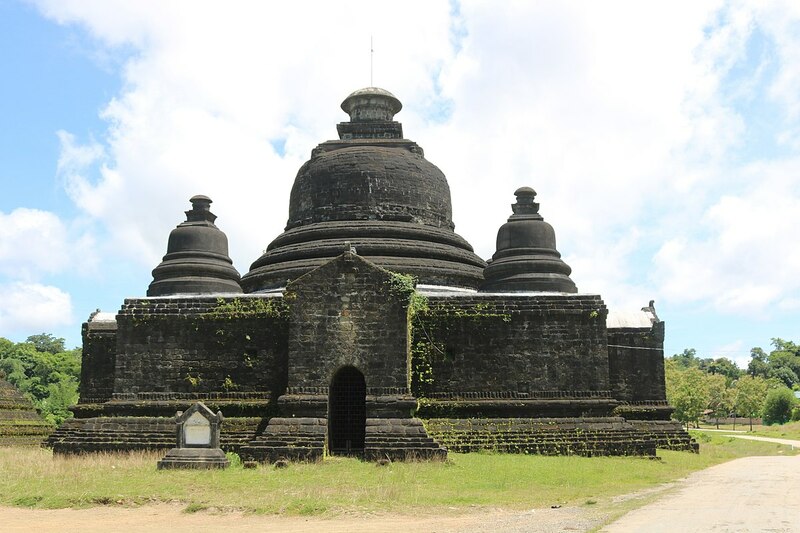 Ratanabon Temple is a solid stupa in Mrauk U, Rakhine State, Western Myanmar. The pagoda is located at the northwest corner of the Shite-thaung Temple. According to local legends, it is said to have jewels and images enshrined in the central stupa but none have ever been found. It was built in 1612 by King Min Khamaung and his wife. 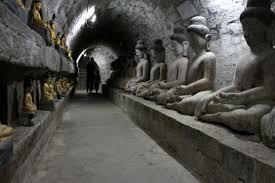 Mrauk U is a primarily Buddhist site, there are several religious buildings of other faiths. The most notable would be the old Shindhikhan Mosque, built during Min Saw Mon's reign, in the southeast of the town. Friar Manrique also mentions the presence of a Roman Catholic church and a small number of converts and foreign born Catholics. The most popular mode for tourists to travel to Mrauk U is to take a domestic flight from Yangon to Sittwe and board a boat from Sittwe against the Kaladan River. The hotels in Mrauk U also arrange private boat services to and from Sittwe.